If the paved, tiled or stone areas around your property or external walls are stained and dirty use our jet washing services to get them back to clean condition. We provide excellent pressure washing of tiles, natural stone, concreted, wooden and hard outdoor surfaces. Our cleaning technicians are qualified and trained to work with pressure washing machines using hot or cold water and cleaning solution. They can remove the stains, grime, paint splatters, moss, weeds, algae and soiling from all hard surfaces. 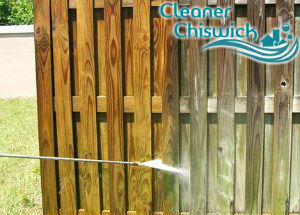 Use our jet washing services available in Chiswick W4 to maintain the external areas around your domestic and commercial estate in good state. If you are concerned about the cleanliness of your outdoor areas and want to have your patio, pavements, driveways or playgrounds washed, use our professional services. The jet washing which we provide guarantees effective removal of moss, weeds, algae and lichens that make tiles and natural stone surfaces slippery and dangerous. Using powerful pressure washing machines, our technicians can transform overgrown and dirty hard surfaces to perfectly clean condition. We use specialised machines that work under pressure with hot or cold water and suitable detergents. 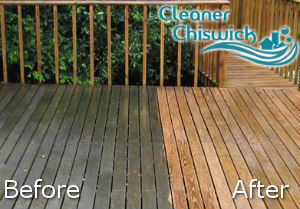 Book our affordable jet washing services available in Chiswick during all days of the week and you won’t regret. Our staff provide professional cleaning of playgrounds, driveways, car parks, pavements, external walls and decks. They need access to water and drainage to implement the necessary cleaning procedures. Use our customer centre to schedule the sanitising of your soiled and overgrown outdoor areas. Our pressure cleaning services can be used by homeowners and holders of business estates in W4 every day of the week. We clean tiles, pavements, natural stone areas, brickwork, wood decks and other hard external surfaces using high-end machines and effective cleaning solutions.